This blogpost has been on my to do list for a very long time, actually since February when I got this bag! In the February half term when I was off school I went to Rome which you may already know if you’re a reader of my blog as I did a Rome makeup haul. So I did some serious damage shopping there and that didn’t even include my Valentino handbag. I really love watching and reading what’s in my bag videos and blogposts but I wanted to wait until I got my first ever designer handbag to do one. It wasn’t intentional getting a handbag in Rome, it just happened, but when I saw it I instantly fell in love. I think the fact I got an Italian designer handbag in Italy made it really special as well. I can’t find this anywhere online but all I remember from the shop was that this was part of the new collection. Inside, this handbag is one large compartment with a zip pocket and the handles fit perfectly over the shoulder almost like a tote bag but more structured. I do carry a lot around in my handbag, I’m prepared for all uncertainties! 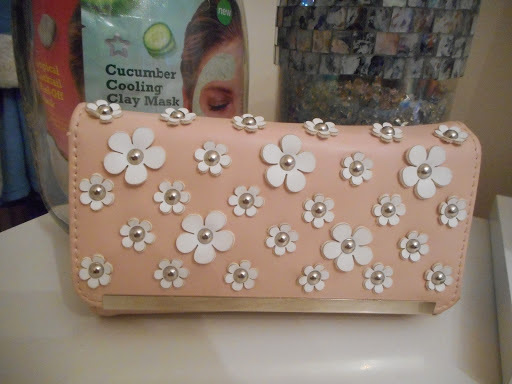 First off, I always carry a purse and this pink flower one is so gorgeous, it reminds me of the Marc Jacobs fragrances. I got this last summer and I unfortunately don’t think they’re selling it anymore. Inside it has card and note slots and a change compartment. I keep my teen card (for buses), loyalty cards and debit card in here. It’s just a really beautiful purse and it doesn’t seem to scuff or damage easily which is always a good thing. The pastel pink is perfect for the summertime and I’m not planning on changing my purse anytime soon as Newlook purses are such good quality! Next are my keys, my actually key itself is so cute as it’s a pink daisy print. I take these everywhere with me because I guarantee the one time I don’t have them will be the time I’m locked out. The chocolate frog keyring is from Harry Potter world as I visited there at New Year. Then the underground keyring is from a previous trip to London and I just really liked it. Keyrings are a really nice thing to have as they can remind you of people and places. Mind, I do have a lot more but they can be very bulky in your bag so I took a few of mine off and kept my two favourites. I always carry my iPhone 5 around with me and to accompany it, a pair of apple headphones and a charger. 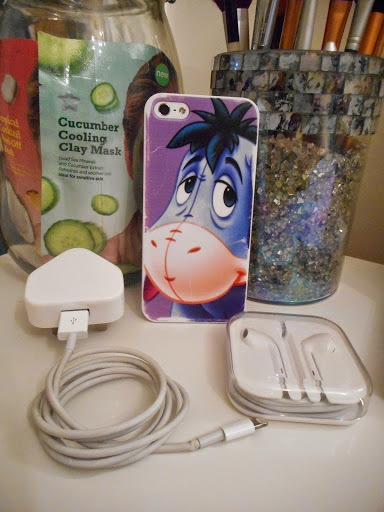 If you don’t already know, I love Eeyore, he’s my favourite disney character. That’s why it’s extremely fitting that I have the cutest phone case of him. Carrying my charger around with me is so important as I’m on my phone a lot whilst out and about so there’s a very likely chance that my phone will die especially with the rubbish apple battery. A good idea would probably be to get a charger phone case as you don’t need a plug socket which can be hard to come across *notes to self to buy a charger phone case*. The apple headphones are my favourite style as the ones with the plastic bits hurts my ears. One bad thing about the apple chargers and headphones are that they break so so easily, I think I’m on my second charger and third pair of headphones… And they’re extremely expensive too. So this is the bit I’m slightly ashamed of, I carry a lot of toiletries around.. I’m that person people come to if they need anything, and to be honest I usually have it! In the zip pocket inside the bag, I keep my keys, and when I got everything out these two other items were in there too. 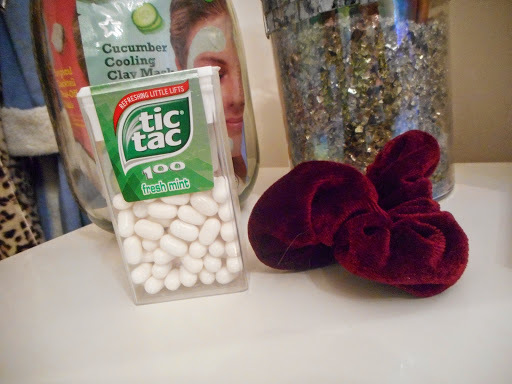 I carry fresh mint tic tacs around with me as an alternative to chewing gum as I’m not really a fan of it as I think watching somebody who has a piece in there mouth is the most disgusting thing and I don’t want to be that person. If my hairs annoying me, I just like to throw it up but sometimes just a bobble doesn’t look very good but a scrunchie makes it look like you’ve put that little bit more effort in. This scrunchie feels like velvet which I find also means your hair doesn’t get caught in it. Next I carry around my blogpost idea notebook as I always get the best ideas in the weirdest of places like on a bus or while I’m shopping. Then seeing as I’m the world’s most forgetful person, if I don’t write it down straight away, the ideas gone and never coming back! The print on the notebook is so gorgeous, I absolutely love the combination of navy and orange as well. As this is a notebook, it’s relatively thin which is so handy for my handbag and it isn’t massive taking up a lot of room. There’s always a pen in my bag as well because I can’t write anything down in my notebook otherwise and I or somebody else will always need a pen for something so it’s just handy to have one. My camera is always chucked in my bag last minute incase I see something that I want to get a really professional photo of. I have the black Nikon coolpix S3700 digital camera which I got for Christmas and I love it. It has a 20 mega pixel camera so takes amazing photos and I love how easy it makes taking a good quality photo as an amateur. Lastly, I always carry a big bottle of water and a cereal bar around. I drink so much water during the week but sometimes on a weekend when I’m busy I forget to drink it. If I take a big bottle with me, it reminds me to drink water which is very good for me as often I’m travelling by bus on a weekend and drinking lots of water helps with my travel sickness. Fiji water bottles are so pretty so I just refill mine with filter water to take with me. You never know what could happen to you so I always prepare for any circumstance. I always take a cereal bar in my bag with me incase something happens and I’m hungry with no access to food. The nakd cereal bars are made with healthy stuff and no refined sugar which I also find helps with my travel sickness. They’re super tasty and helpful if I’m shopping and my energy levels start to lag. The ginger bread, cocoa orange and cocoa are all very tasty but the ones I bought recently are the cashew cookie ones. They’re delicious and you don’t feel guilty after eating one like you would with a chocolate bar!